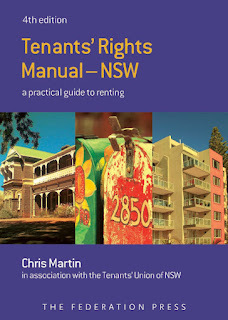 For more than 30 years, the Tenants' Union's Tenants' Rights Manual has been pored over by tenants, community workers and tenant advocates (and landlords, agents, lawyers and Tribunal Members) as the best practical guide to renting in New South Wales. The 4th edition of the Manual is to be launched next month, on 15 October – it's an Anti-Poverty Week event. The new edition is completely revised to cover all the changes introduced by the Residential Tenancies Act 2010. It also includes an expanded chapter on social housing, and a new chapter on marginal renting, with information for boarders and lodgers on the new Australian Consumer Law. You can order your copy through the publisher, Federation Press, or ask for it at your local library. If they don't have it, suggest that they get one (or several)!